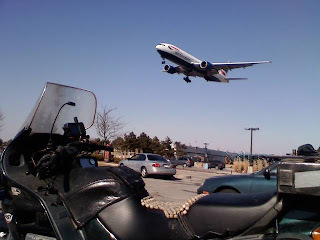 Today was the first day of the Spring Motorcycle Show in Toronto. 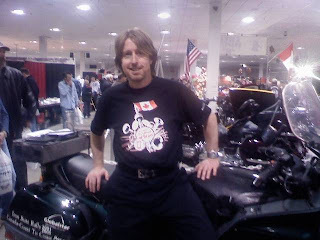 I really like these shows because it gives me a chance to talk to a diverse group about the sport of motorcycling. Very interesting. Funny thing happened today, though. Two different people told me about the fact that they use car tires on their motorcycles. I am not referring to a sidecar rig that spends all its time in the upright position. I am talking about a bike that is supposed to do what all motorcycles do in a corner - LEAN! These guys are running tires with flat profiles and telling me it doesn't adversely affect the handling of the bike in any way. Twice today I have been told this. They do it because car tires last much longer than motorcycle tires, and are less expensive. I was told not to doubt it, just to try it. Well speaking as someone who has had a motorcycle accident and survived, why would I want to invite disaster? I didn't tell them this, but I was certainly thinking it. These guys have a screw loose. DO NOT DO THIS! Here I am at the show today. My hair is getting a little long. I guess that it the way it will look when you haven't had a haircut in over 8 months! Here I am geocaching at the airport the week before.